Merle Wood & Associates sends word of a $500,000 price reduction on John Cohen’s central listing for sale, the 39 metre motor yacht Echo. Built in aluminium by Australian superyacht yard Oceanfast with styling by Jon Bannenberg and naval architecture by Phil Curran, Echo was launched in 1990. Sensation Yachts in New Zealand were commissioned to undertake a major conversion in 2003, which also saw her hull lengthened. Anita Unger was responsible for the interior decor in high-gloss American cherry wood accommodating eight guests in four staterooms - all with en suite facilities - plus seven crew in three cabins. Her well designed exterior decks feature plenty of space ideal for relaxing, al fresco dining and water sports. A refit in 2013 featured rebuilds of her jet drives, main engines and exhaust systems, fresh Awlgrip paint, revamped electrical & domestic systems and a stunning new décor. Twin Deutz 1,850hp engines give her a range of 1,400 nautical miles at a cruising speed of 18 knots. 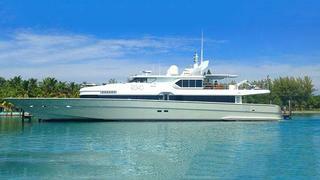 Echo will be available for viewing at the Fort Lauderdale boat show, now down from $3,995,000 to $3,495,000.